It's not hard to see why delicate tattoos are so popular—they're subtle, easy on the eyes. Ready to get your own minimalist ink? Read on for the seven Filipino tattoo artists you can go to to get your delicate tatt done ASAP! How to contact: She's an artist at 55Tinta and her schedule is on Tuesdays, Fridays, and Saturdays from 1 p.m. to 10 p.m. To schedule an appointment, email 55tinta@gmail.com or call at (02) 435 3383. Minimalist tattoos are mostly thin linework, which Annie has done a lot of! She's also a pro at doing script tattoos, so if you're planning to have your name or your favorite quote permanently etched on your skin, hit her up. How to contact: You can catch her at either 55Tinta or Afrokush Studio. Or you can email her at maansimbajon34@gmail.com or DM her on Instagram. The dainty flower ink looks so life-like! Maan def has the right skills and technique to draw really thin lines. How to contact: Email her at skylenecharm@gmail.com or message her on Instagram. You can also head to Moth and Machines Tattoo Studio to see her. The catch? It's in Batangas City. Although Charm does watercolor tattoos more, she's also an expert at delicate lines and shading. How to contact: You can email her at katztatztattoo@gmail.com. However, she is booked for the rest of the year. If you plan to get a tattoo by her, we recommend that you schedule your 2019 appointment RN. 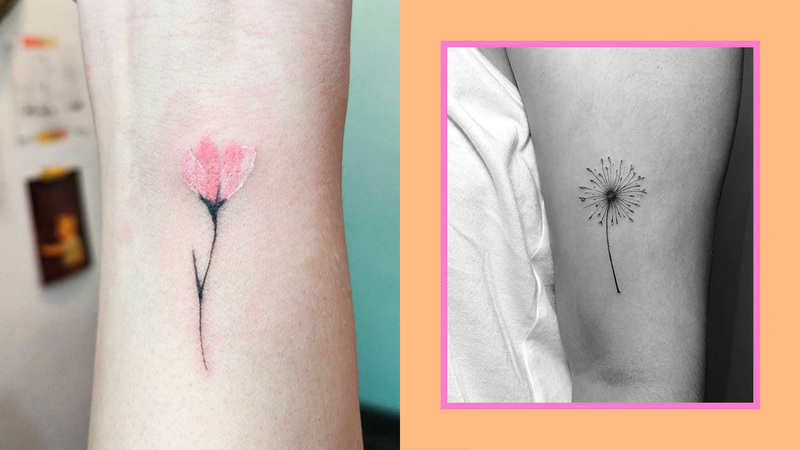 This 55Tinta artist may be known for her pretty watercolor ink, but she also has the ~*skillz*~ to blend watercolor + delicate linework for the perfect, pretty body tat! How to contact: Email her at wijilacsamana@gmail.com. Another artist who specializes in watercolor ink, but can also beautifully do subtle tattoos. How to contact: Email her at alyssabalaoing@gmail.com. While Alyssa's designs are more on the complex side, she can still make the simplest tattoo look TDF. How to contact: DM her on Instagram to find out when she'll be in Manila (She's based in Cavite. ), or contact Young Wild & Inked on Facebook to schedule an appointment. Still contemplating on what tattoo to get? How about light and delicate Roman numerals like this one?